[-317-] MIDNIGHT.-THE HAYMARKET, AND THE SUB-EDITOR'S ROOM. MIDNIGHT: an awful sound. Supposing you were to be hanged at three o'clock in the morning, as I am doomed to be, in a literary sense, how would you like to hear twelve o'clock sound? But three hours more to live ! In three hours "the sheriff he will come," and the chaplain, and the hangman, as they came to Mr. Samuel Hall en route for Tyburn. In three hours the clock will run down; the pendulum shall oscillate no more; Time shall rest on his scythe; the last grain of sand shall run out, and of these ephemeral papers you shall say fuit. We have clomb the hill together, and we will rest together at the foot. Glancing over my map of London, and retracing the course of our peregrinations, I find, with some complacency, that we have not, after all, left many parts of the metropolis unexplored. We have been to [-318-] Camberwell and to Hyde Park Corner; to Pentonville and to London Bridge; to Billingsgate and to Euston Square. It is true, that we have not yet penetrated to the interior of Buckingham Palace, or the condemned cell at Newgate, nor do I think that I shall assume the part of the Boy Jones or a visiting magistrate for your amusement; but we have been "behind the scenes" of more places than theatres since this clock was first wound up. It is not without regret now, that I linger over and daily with my few remaining hours. They have been very pleasant ones for me. 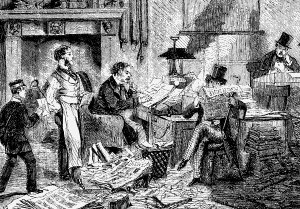 I shall miss the printer's boy (for, be it known, I am about to abandon literature and go into trade, though I have not yet settled the precise business - corn, or coals, or commission agency). I shall miss, beyond aught else, the daily deluge of letters from anonymous correspondents - praising, blaming, complaining, or inquiring, but all, I am glad to say, very appreciative readers of my shiftless writings. But we have come to the complexion of midnight, and the hour must be described. It is fraught with meaning for London. You know that in poetical parlance midnight is the time when churchyards yawn (they had need to be weary now, for the Board of Health won't allow them to receive any occupants intra muros), and graves give up their dead. And there be other grave-yards in London town - yards where no tombstones or brick vaults are - that at midnight yawn and send forth ghosts to haunt the city. A new life begins for London at midnight. Strange shapes appear of men and women who have lain a-bed all the day and evening, or have remained torpid in holes and corners. They come out arrayed in strange and fantastic garments, and in glaringly gaslit rooms screech and gabble in wild revelry. The street corners are beset by night prowlers. Phantoms arrayed in satin and lace flit upon the sight. The devil puts a diamond ring on his taloned finger, sticks a pin in his shirt; and takes his walks abroad. It is a stranger sight than even the painter Raffet imagined in his picture of Napoleon's midnight review, and it is, I think, a much better thing to be at home and in bed, than wandering about and peeping into the mysteries of this unholy London night life. I know this book (to my sorrow) well; have conned its grim pages, and studied its unwholesome lore, attentively. But I am not about to make you a too-recondite participant in my knowledge. Were it not that the appointed hours were meted out to me, and that from one of the hours-midnight-the Haymarket is inseparable, the wicked [-319-] street should find no place here; but I must be faithful to my trust, and the bad thoroughfare must be in part described. Foreigners have frequently pointed out to me a peculiar aspect of London, and one which appeals strongly to the observant faculties, and which, nevertheless, may escape us Cockneys who are to the metropolitan manner born. It is the duality of the huge city, not so much as regards its night and day side, as in its Sunday and weekday appearance. And this is not wholly to be ascribed to the shop shutters being closed. The Strand on Ash Wednesdays and Good Fridays is still the Strand; but on the Sabbath it would seem as though every house in the West and East ends had put on its special Sunday suit, and had decorated itself with a certain smug spruceness quite marked and distinct. You have a difficulty in recognising your most familiar streets. Regent Street is quite altered. The aspect of Piccadilly is entirely changed; and Cheapside is no more like the Cheapside of yesterday than Hamlet is like Hecuba. The people, too, are not by any means the same people you meet on week-days. Not only their clothes are different, but their faces, their manners, their very gait and bearing, seem changed. You meet people out walking on Sundays, who during the week are confined to places where they are hidden from the public gaze, or are at most but half visible. You see the bar-maids' skirts and the pawnbrokers' legs on Sundays. From Monday to Saturday you can see but their busts. You may nod to a sheriff's officer on Sunday without entertaining any apprehensions as to the piece of paper he may have against you in that dismal black leather pocket-book of his. The omnibus roofs are covered, the steamboats' decks are crowded, the cabs full, the pavement thronged, the very saddle-horses bestridden by men who seem of a different race to the outside world of the previous four and twenty hours. Dirty streets look clean; disreputable streets decorous; and thoroughfares that were as still as mice during the week, become quite noisy on Sundays with carriage and cab wheels, as sinners of wealth and distinction rattle up to the doors of the fashionable chapel. It is the privilege of the unique Haymarket to be like its week-night self on Sunday; but in the six mundane days to be a totally different Haymarket from the street which it becomes immediately after midnight. True, by daylight, and during the early part of the evening, it is that which it will remain all night: a broad thoroughfare inclining slightly downhill northward; a theatre on its eastern, a colonnaded opera~house on its western side; a thoroughfare containing a sufficiency [-320-] of shops for the sale of general merchandise, but, predominating above these, a crowd of hotels, restaurants, cigar-divans, coffee-houses, and establishments for the sale of lobsters, oysters, and pickled salmon, according to the seasons in which those dainties are considered most fit to be enjoyed. But it is not the same - no, not at all the same - Haymarket to which it will suddenly turn, when the clock of St. Martin's church shall proclaim the hour of midnight. The change, at first imperceptible, is yet in a moment more immense. As though Harlequin had smitten the houses - and the people also - with his wand, the whole Haymarket wakes, lights, rises up with a roar, a rattle, and a shriek quite pantomimic, if not supernatural. The latter image would, I think, be the most vrai semblant. "Hey for fun!" "How are you to-morrow?" and "How are you?" are the cries and the pass-words. The painted Clown (in mosaic jewellery, and all- round collar, an astonishing cravat, and a variegated Shirt) grins his grin and tumbles on the pavement. He is not above stealing an occasional sausage, bonneting a policeman, overturning an image-boy's stock in trade, or throwing the contents of a fishwoman's basket about. Harlequin in a mask and patchwork suit is here, there, and everywhere, conjuring money out of people's pockets, and perpetually pursued by a vindictive Sprite, habited in the garb of a police constable. The lean and slippered Pantaloon hobbles over the flags, and grimaces, with his wicked old countenance, beneath the gas-lamps. And Columbine, Wallah billah! Columbine in muslins, spangles, and artificial flowers, is here, there, and everywhere, too, and dances her miserable jigs to the sorry music of the fife, viol, and tabor, squeaking, scraping, and thumping at the gin-shop by the corner of the court. Midnight: the play is over, and the audience pour from the Haymarket Theatre. The aristocratic opera season is concluded by this time of the year, and the lovers of the drama have it all their own way. Crowds of jovial young clerks and spruce law students cluster beneath the portico, yet convulsed by the humours of Mr. Buckstone. Happy families of rosy children, radiant in lay-down collars, white skirts and pink sashes, trot from the entrance to the dress-circle under the wing of benevolent papa and stout good-humoured mamma, with a white burnous, and a tremendous fan; their healthy countenances all beaming and mantling with smiles, and joyously recalling the jokes of that funny old man in the farce, or expatiating on the glories of the concluding tableau, with its tinsel and gold leaf, its caryatides of ballet girls, and its red and blue fire, in Mr. Talfourd's last sparkling burlesque. [-321-] Happy, happy days and frame of mind, when the theatre can give such delights as these. Isn't it better to sit amazed and delighted in the front row of the dress-circle, or on the third row of the pit, roaring at the stalest Joe Millerisms, and clapping the hands at the tomfool feats of tumbling, than to lie perdu in a private-box, now scowling, and now sneering, like Stricknine, the great theatrical critic, who will go and sup afterwards at the Albion, on an underdone mutton-chop, and, calling for pen, ink, and paper, slaughter the inoffensive burlesque mercilessly. Stricknine can't write burlesques himself. He can't write books; he can only slaughter, and must have been apprenticed in his youth to Bannister or Slater. And, slaughterer as he is, he is not equal to the manly business of knocking down a bullock with a pole-axe. Give him a long keen knife, and he will puncture the neck of a lamb, and that is all. Ethelred Guffoon (who has been to three theatres to-night) hustles out from his stall with his lorgnette in its shagreen case. Mr. Kickeroe, Q.C., comes from the pit, shouldering his umbrella. Kickeroe has been a constant visitor to the pit of the Haymarket any time these twenty years, though he could easily afford a private box once if not twice a week. His greatest extravagance is to purchase four upper-box tickets when Mr. Buckstone takes his benefit. He is an ardent admirer of the Haymarket five-act comedies; and people say that many of his most effective and jury-touching perorations have been drawn from the sentimental "tags" of the Haymarket dramatists. Trotting down the box-stairs, too, comes vivacious, learned, chatty, kindly, abusive Mr. Boblink, with his head permaturely white, but his heart as green as it was thirty years since. Mr. Boblink is generally beloved, though regarded with a humorous terror for his vituperative qualities. He expatiates on the necessity of breaking butterflies on the wheel, although, good man, he would not harm a particle of pollen on their wings. His fierce language is but the bellow of the blunderbuss: there is no bullet, not so much as a bit of old hat for wadding in his gun. He strikes with a wooden sword, and scourges malefactors with a knout whose lash is made of floss-silk. He wears the mask of a Gorgon horrible to see; but the mask is transparent as glass, and you may descry the honest genial face of the man wreathed with sly smiles behind it. So he goes through life - a bourru bienfaisant - hitting men sounding thwacks with a bladder full of peas, and recording sentence of literary death against culprits, knowing full well that the sentence will never be carried out. To hear Boblink talk, you would [-322-] think him the most malevolent creature breathing. He is so different from smooth, quiet, smiling Mr. Stricknine, (he only scowls when he is alone) who presses your hand warmly, and immediately betakes himself to the Albion, there to make a neat fricassee of your reputation, and, in the most polished and classical language, insinuate that you are a hopeless fool with dishonest propensities. And yet Mr. Boblink has a deadly armoury of his own at home, and knows the tierce and the carte and the "raison demonstrative," and has, when exasperated, proved himself so cunning of fence, that I would see him hanged before I would fight with him in earnest. Supper is now the great cry, and the abundant eating and drinking resources of the Haymarket are forthwith called into requisition. Bless us all! there must be something very dusty and exhaustive in the British drama to make this Haymarket audience so clamorous for supper. By the ravenous hunger and thirst displayed by the late patrons of the theatre, you would imagine that they had gone without dinner for a week. You may sup in the Haymarket as your taste would lead, or as the state of your finances would counsel - if people followed such counsel - you to sup. You may cut your coat according to your cloth. Are you rich - there is Dubourg's, the Hotel de Paris, and the upstairs department of the Café de l'Europe. There is no lack of cunning cooks there, I warrant, to send you up pheasants and partridges en papillotte; filets, with mushrooms or truffles, culinary gewgaws that shall cost five shillings the dish. Yea, and cellarers will not be wanting to convey to you the Roederer's Champagne, the fragrant Clos Vougeot, the refreshing Lafitte, and the enlivening Chambertin with yellow seal; smooth waiters to attend to your minutest wishes, and bring you the handsome reckoning on an electro-silver plateau, and, with many bows, return you what odd change there may he out of a five-pound note. I do not say that the Haymarket contains such gorgeous supper-houses as the Maison Dorée, the Café de Paris, the Café Anglais, or Vachette's; but I have seen some notable parties fines within its precincts. The Haymarket never was virtuous; so there is never any question about the cakes and ale, and the ginger that is hot in the mouth, to be found therein. If still your taste leads you towards French cookery - though you wince somewhat at the idea of claret, Burgundy, and Champagne to follow - there exists a second-class French restaurant or two where succulent suppers may be obtained at moderate prices. If unpretending chops, steaks, kidneys, sausages, or Welsh rabbit, washed down by [-323-] the homely British brown stout, and followed perchance by the soothing cigar, and the jorum of hot anything-and-water: if such be your ambition, I should advise you not to sup in the Haymarket at all; but to wait till one o'clock and sup with me. I will show you the whereabouts. Such chops and steaks and et ceteras, you may indeed obtain in the neighbourhood, but I like them not. 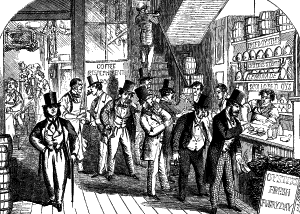 If your funds and your credit be very low, why, you can enter one of the taverns - if you can reach the bar for the crowd of Bacchanalians that are gathered before it, and sup on the quarter of a pork pie, a sausage roll, and a Banbury cake, washed down by a glass of pale ale; nay, if you be yet lower in pocket, and your available wealth be limited to the possession of the modest and retiring penny, you may, at the doors of most of the taverns, meet with an ancient dame, of unpretending appearance, bearing a flat basket lined with a fair white cloth. She for your penny will administer to you a brace of bones, covered with a soft white integument, which she will inform you are "trotters." There is not much meat on them; but they are very toothsome and succulent. It is no business of yours to inquire whether these be sheep's trotters or pigs' trotters, or the trotters of corpulent rats or overgrown mice. They are trotters. Look not the gift-horse in the mouth; for the penny was perhaps a gift, however strictly you may have purchased the trotters. Eat them, and thank heaven, and go thy ways, and take a cooling drink at the nearest pump with an iron ladle chained to it, which is, if I am not mistaken, over-against St. James's Church in Piccadilly. Or, perhaps you are fond of ham-sandwiches. The unpretending dame with the basket will straightway vend you two slices of a pale substance, resembling in taste and texture sawdust pressed into a concrete form, between which is spread a veneer of inorganic matter, having apparently a strong affinity to salted logwood. This is ham! The concrete sawdust is bread! The whole is a sandwich! These luxuries are reckoned very nice by some persons, and quite strengthening. Or, "another way," as old Mrs. Glasse says in her cookery book. At the Coventry Street extremity of the Haymarket stands that celebrated and long-established institution known as the Royal Albert Potato Can. At that three-legged emporium of smoking vegetables, gleaming with block tin painted red, and brazen ornaments, the humble pilgrim of the Haymarket may halt and sup for a penny. For a penny? What say I? for a halfpenny even, may the belated and impoverished traveller obtain a refreshment at once warm, farinaceous, and nourishing. Garnish your potato, when the Khan of the Hay-[-324-]market has taken him from his hot blanket-bed, and cut him in two - garnish him with salt and pepper, eschew not those condiments, they are harmless, nay, stimulating; but ho! my son, beware of the butter! it is confusion. Better a dry potato and a contented mind, than dreadful Irish salt grease-for butter I dare not call it, which may give you a bilious attack that will last for a month. I should like to know what has been the use of my recommending these various grades of supper to you, from the lordly Café de l'Europe to the humble Potato Can, when I should have known all along, and as it were intuitively, that your mind was bent upon oysters, and that oysters after the play you were determined to have. Come along, then, a goodness' name, and if oysters are to be the order of the night, e'en let us have them. [-326-] one prevalent in France relative to the sale of oysters, and the consumers pick them off the shells with little silver pitchforks, squeeze lemon over them, and eat them daintily in many mouthfuls. Fie upon such miminy-piminy ways! Oyster-shops the French don't seem to understand at all. At Chevet's, that vast comestible shop in the Palais Royal, they keep oysters, and lobsters, and prawns, and shrimps-keep them as a show in the windows for a week or two, when, their novelty beginning to wear off, they are disposed of, I presume, to the nobility and gentry. They tell a story of a Frenchman, who hoarded up his money, in order to purchase un homard magnifique, which he had seen at Chevet's, and to which he had taken a fancy. Americans tell me that though the oyster attains high perfection, and is held in culinary reverence as high, in the States, anything resembling our Haymarket oyster-shop is not to be found in New York. But on Broadway Pavement, during the gay night, brilliant lamps, sometimes coloured in fantastic devices, invite you to enter underground temples of oyster-eating. These are called oyster-cellars. Some are low and disreputable enough, and not impassible to imputations of gouging, bowie-kniving, and knuckle-dusting; but others are really magnificent suites of apartments, decorated with mirrors and chandeliers, and glowing with gilding, mahogany, and crimson velvet; and here you may consume oysters as small as periwinkles or as large as cheese-plates - oysters of strange and wondrous flavours - oysters with bizarre and well-nigh unpronounceable names - oysters cooked in ways the most marvellous and multifarious: stewed, broiled, fried, scolloped, barbacued, toasted, grilled, and made hot in silver chafing dishes like the delicious preparation known as "despatch lobster." You wash down suppers in oyster-cellars such as these with Hock and Champagne; yet for all the splendour and the rarity of the cooking, and the variety of oysters, I will abide by the Haymarket oyster-shop, rude, simple, primitive as it is, with its peaceful concourse of customers taking perpendicular refreshment at the counter, plying the unpretending pepper-castor, and the vinegar-cruet with the perforated cork, calling cheerfully for crusty bread and pats of butter; and, tossing off foaming pints of brownest stout, (pale ale-save in bottles, and of the friskiest description-is, with oysters, a mistake) contentedly wipe their hands on the jack- towel on its roller afterwards. As in this real life of ours, Old Age and Infancy often meet on neutral ground, and the prattle of the child goes f6rth with hand out-[-327-]stretched to meet the graybeard's maundering: so, oh reader, do I find the beginning and the end of these papers drawing closer and closer together. Ere many hours they will meet; and their conjunction shall be the signal for their decay. You will remember how, when the day was very young, the morning scarce swaddled, and kicking in his cradle with encrimsoned heels (Aurora, the nurse, had chafed them), we visited a great newspaper office, and saw the publication of the monster journal. Now, when midnight itself is fallen into the sere and yellow, we stand once more within the precincts of journalism. This is not, however, the monster journal that has all Printing House Square to roar and rattle in. No: our office is in the Strand. We are free of the charmed domains. We pass up a narrow court running by the side of the office, push aside a heavy door, ascend the creaking staircase, and discreetly tapping at a door, this time covered with green baize, find ourselves in the presence of Mr. Limberly, the sub-editor of the "Daily Wagon." Let us cast a glance round the room. What a litter it is in, to be sure! what piles of newspapers, home and country ones, mangled and disembowelled by the relentless scissors, cumber the floor! More newspapers on shelves-old files, these-more on the table; letters opened and unopened, wet proof-sheets, files of "copy," books for review, just sent by the publishers, or returned by the reviewers, after they have duly demolished the contents and the authors. And all about the room are great splashes and dried-up pools of ink, and the ceiling is darkened with the smoke of innumerable candles-gas was, until very lately, considered anything but orthodox in a newspaper office, and many sub-editors still find its sharp, harsh, flickering, though brilliant light, far inferior to the honest, though evil-smelling, old tallow-candles, in their tin sconces and japanned shades. The Daily Wagon, be it understood, is a newspaper of the good old Conservative way of thinking - no Liberal notions, or humbug of that sort: Church and State, strict constitutional and social discipline (including game-laws, religious disabilities, church-rates, unequal taxation, rural justices' justice, and flogging in the army and schools) - the True Blue British line of politics, in fact. Thus situated, the "Wagon," one of whose proprietors is said to be a peer, another a bishop, and a third a brewer-nothing could be more respectable- sticks to its old office, its old rooms, and its old staff. The two former have not been painted within the memory of man; though it must be admitted that the latter wash quite as frequently as the [-328-] employés of the "Morning Cracker," with its bran-new offices, its bran-new furniture, its bran-new type, paper, machines, writers - bran-new everything but ideas. The "Daily Wagoners" affect to sneer at the " Morning Cracker," which, in its turn, laughs the "Wagon" to scorn; but both combine in abusing the monster journal of Printing House Square. "Wagoner" and "Cracker" are both high-priced journals. So, of course, they both feel bound to ignore even the existence of a journal called the "Daily Bombshell," which somehow manages to keep up a better staff of writers, and a larger establishment, to give fresher news, more accurate intelligence, more interesting correspondence, and reflections on public events incomparably more powerful, than its high-priced contemporaries, all for the small sum of one penny. The "Wagon" and the "Cracker" are in a chronic state of rage at the "Bombshell," though they pretend to ignore its existence; but one day the bishop who is interested in the "Wagon," hearing that the circulation of the abhorred "Bombshell" exceeded fifty thousand, while that of his own beloved journal fluctuated between five and seven hundred, drove down in almost delirious excitement to the offices of the "Wagon" - drove down in his own carriage, with his mitre on the panels - and suggested to Mr. Fitzfluke, the editor, that the price of the paper should forthwith come down to one penny. But Mr. Fitzfluke shook his head in respectful deprecation of the proposition, and summoned to his aid Mr. Limberly, who likewise shook his head, and whispered the magic word "advertisements." A grand consultation between the proprietors took place next day, whereat the brewer came out in a rabidly conservative point of view, and declared, striking a leathern-covered table, that he would sooner see his own "Entire" retailed at a penny a pint, than submit to an imitation in price of the "rubbishing prints" of a set of "dam radicals." So the "Daily Wagon" keeps up its price, and manages to crawl on in a tortoise-like manner, supported by its advertisements. It sleeps a good deal, and doesn't want much to eat; and will bear being trodden on, stumbled over, nay, occasionally jumped upon, without seeming in the least to mind it. [-330-] war in the East or Peace in China, either a fluctuation in the funds at St. Petersburg, or a murder at Haverfordwest; either the wreck of a steamer, with all hands lost, on the north-west coast of Ireland, or the arrival in the Mersey of a clipper ship from Australia, with a few score thousand ounces of gold in her treasure-room, to say nothing of the nuggets, the gold dust, and the bankers' receipts in the pockets of her wide-awake-hatted passengers. But all is fish that comes to Mr. Limberly's net. Leading article and literary criticism, theatrical notices and prices of railway and mining shares, advertisements and letters from eulogistic or indignant correspondents, telegrams and foreign tittle-tattle, fires, murders, fatal accidents, coroners' inquests, enormous gooseberries, showers of frogs, the acceptances of the St. Leger, and the prices of hops in the Borough Market: he looks upon all these items but as so much "copy," for which the master printer is waiting, and which are required to fill the ever-yawning columns of the "Daily Wagon." Snipping and pasting, extracting, excising,, revising, and correcting, Mr. Limberly will work late into the night and early into the morning; but he will not dream of retiring to rest till the paper itself be "put to bed," -i.e. laid on the printing machine for the requisite number of copies to be struck off; and even then he will probably go and smoke a cigar at the "Crimson Hippopotamus," in the Strand, hard by-the great house of call for morning journalists - before he hails his matutinal cab, the driver of which waits for him on the stand, and looks out for him quite as a regular customer, and rattles over Waterloo Bridge to his well-deserved bed.